In this episode, in the middle of an argument about whether to continue on to Forest Terminal or try to reclaim Zoe's spirit, Bokomon decides to call a Nintendo Gameplay Counselor. 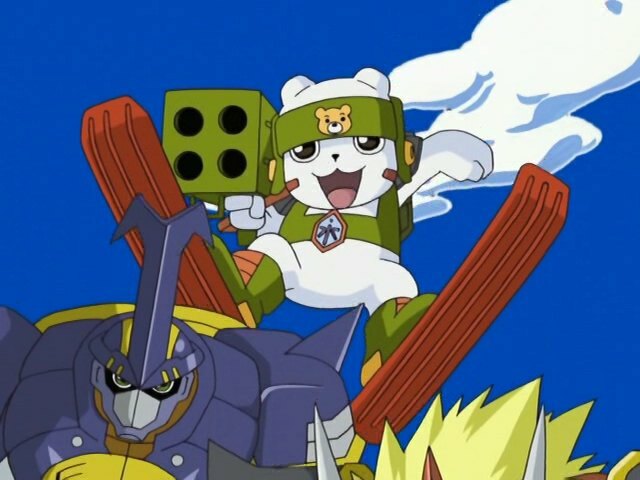 Digimon Frontier was meant to be an antithesis to Digimon Tamers. Something happier, brighter and more silly than its predecessor- a fluffy dessert to follow a succulent main course. At times, this suits the show just fine, and there's nothing wrong with being a lighthearted alternative when done right. Then there are times when an episode can't decide if it wants to be silly or serious. And then there are times like this when a goofy opening act seems to exist solely to dilute what should be an intense climax. If you take the one-line synopsis of this episode, “Takuya is forced to attack a friend possessed by a powerful renegade beast, only to become possessed by the powerful renegade beast himself,” you're looking at some decent material. There's a lot to play with here! But the first half of the episode is so ridiculous and so stupid that it's hard to get into the mindset that Takuya is suddenly forced into a very difficult and very serious situation, along with a poor Shamanmon that is impossible to take seriously. The fact that Bokomon has to drag them all to see him is bad enough. The group is demoralized after losing the spirit of wind. JP adamantly argues in favor of getting it back, while Koji wants to continue on to Forest Terminal. Everybody else backs Koji, though nobody else is passionate about it. Zoe herself is naturally depressed, feeling punished for doing the right thing but not wanting to burden the team with a selfish side quest. Rather than forcing Takuya to make the difficult decision to soldier on (which would be correct as they'd likely encounter Grumblemon again anyway... and it's not like Kazemon's all that effective), Bokomon halts all proceedings and takes them to see a fortune teller. Remember all those times playing Zelda games that you went to see the fortune teller to figure out where to go next? Yeah, me neither. The gypsy village looks intriguing for about one exterior shot before they get there and learn that its inhabitants are all annoying and/or stupid. Bokomon claims that Shamonmon is the “real deal” and that the team is sure to benefit from his wisdom. If, that is, they can handle his wisdom. He's not sure. Bokomon builds Shamonmon up to be this incredible sage akin to Gennai or Piximon. What we end up with is a Goblimon palette swap that hops around and babbles on about stuff that comes to pass in the next ten minutes. Was this really something the digidestined couldn't handle? I've railed on prophecies before, and the times the show has done it right (Ghost Wizardmon's) and wrong (end of the Myotismon arc). This one is garbage, forecasting nothing more than Grumblemon summoning Titan and trying to control BurningGreymon. The kids proceed to come across Grumblemon and his Golemon slave so quickly that they haven't even digested those words yet. That makes it hard to take advantage of them. 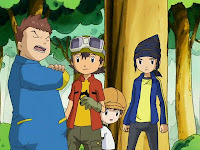 Agunimon, Beetlemon and Kumamon gain the upper hand by working together (using the primitive technique of attacking all at once), but Gigasmon captures Tommy's spirit anyway. 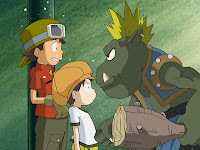 The second half of the prophecy comes to pass only when Shamonmon stumbles across Takuya's beast spirit himself, turns into BurningGreymon, kills Golemon and scares away Gigasmon... then resists the spirit just long enough for Takuya to beat the snot out of him. This is where the episode actually starts: Takuya scans the spirit, undergoes the painful beast spirit evolution process, and goes bananas. Koji becomes KendoGarurumon to fight him off and, at last, the battle we've been waiting for comes to pass. Or at least it will next time. It's only a slight improvement, but at least we're seeing a little bit of character out of Grumblemon, as his pride is wounded by getting roughed up by KendoGarurumon in all the chaos. He strives for a flawless victory and goes to even further lengths, despite him mostly dominating the battles so far. They don't do or say anything remotely relevant, but those three Tanemon were adorable and I'm happy they were included. 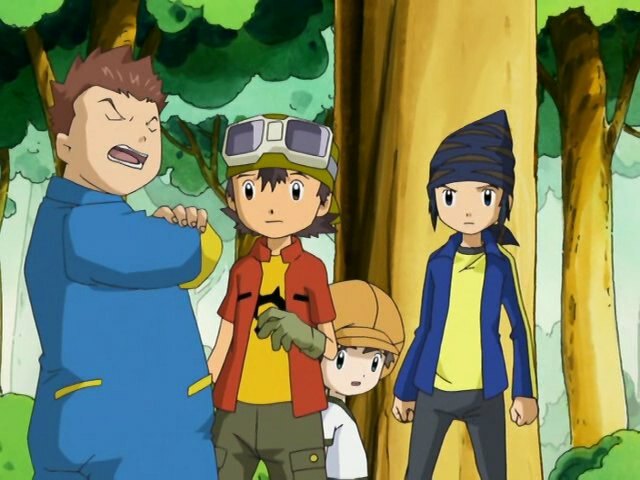 Takuya kinda drops the ball in letting Bokomon dictate the team's direction after JP and Koji's argument. If he had insisted on proceeding to Forest Terminal (something Koji and Zoe also supported), not only would it have been a moment of true leadership, it's also an action that none of the other season's leaders would ever choose. Tai, Davis, Takato, Marcus and especially Mikey would never concede Zoe's spirit, and they'd all be wrong. Individual appearances may vary, but Gekomon on the whole look stupid and have a grating voice. How is it that this is possibly the only Digimon with a speaking part in each of the first four seasons? I did like how they made fun of the fact that Shamonmon is a palette swap of Goblimon. It is guts for them to make fun of themselves that way. I remember thinking how Shamonmon explained how he found the beast spirit felt really out of nowhere and messed up the flow. I think it would have been better to show it happen in real time then set up a weak plot twist that the spirit is possessing him just to break the tension with a lengthly flashback explanation out of nowhere. This was a really cool episode.I really liked how 'Burininggreyshamonmon' totally ravaged Golemon. -Not realizing that with or without her Digi-Spirit, she's still a useless tease.